The Oppo A3s is now official, and it sports a 4,230 mAh battery alongside a 6.2-inch notched display. The device and all of its promotional material already leaked earlier this week, but now it’s out officially. Oppo is calling the display a FullView display, something that the Oppo Find X also features. The device is powered by the Qualcomm Snapdragon 450, a lower powered processor which should maximise the battery life. It also has 2GB of RAM and is running on Android 8.1 Oreo. Obviously, it’s no flagship, but this device should be great for basic tasks. The Oppo A3s also has a dual camera system on the back, comprised of a 13MP f/2.2 sensor and a 2MP f/2.4 sensor for depth perception. We have yet to see any photos from this device yet, but it could be a decent shooter on a budget. The front-facing camera is an 8MP f/2.2 sensor which also sports a “speedy facial unlock.” How fast that actually is has yet to be seen, as this particular device doesn’t have a fingerprint sensor. In terms of other extras, you get 16GB of storage that can be expanded with a microSD card. The coveted 3.5mm headphone jack is also present, so you don’t need to resort to wireless solutions. Accompanying that massive battery is a microUSB port, though we don’t know if it supports fast charging. 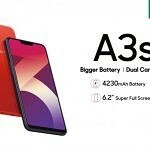 The regular Oppo A3 supports VOOC fast charging (akin to OnePlus’ Dash Charge), so we can hope the Oppo A3s supports it too. The Oppo A3s is going to be available from Amazon.in, Flipkart, and PayTM, as well as offline stores from July 15 at a cost of ₹10,990 (~$160). You can check out the full specifications below.